In 2016, more than 100 million passengers used public transport in the country of 600,000 people. The Luxepo terminus, Luxembourg city. THE TINY EU country of Luxembourg is seeking to make travel free on its trains, trams and buses as part of efforts to reduce traffic congestion and air pollution. The re-elected coalition government of liberal Prime Minister Xavier Bettel said “free public transport will be introduced in the Grand Duchy of Luxembourg’s territory” from early 2020. In 2016, more than 100 million passengers used public transport in this tiny prosperous country of 600,000 people sandwiched between Belgium, France and Germany. Luxembourg absorbs daily 190,000 workers and employees from neighbouring countries, half of them in France and the other half split between Belgium and Germany. Press reports said the traffic problem was a major challenge for politicians seeking election as congestion was set to worsen with population growth in Luxembourg. 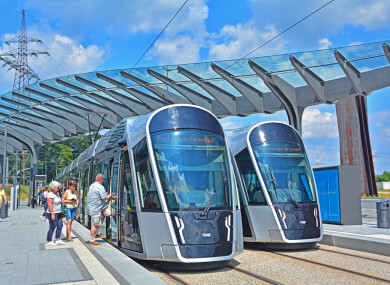 Luxembourg’s transport ministry said it cost 491 million euros a year to run public transport, with ticket sales and subscriptions bringing in 40 million euros. Georges Merenz, who heads the FNCTTFEL-Landesverband, Luxembourg’s main transport union, expressed concerns that the government plan would lead to job losses if nobody was needed to sell tickets. “As long as it is not cleared up, we cannot accept that,” Merenz told AFP. He added he was also concerned people in rural areas would not benefit from free travel. A meeting is planned for Monday between his union and the minister in charge of mobility and public works, the ecologist Francois Bausch. In January 2013, Tallinn, Estonia became the first capital city in the European Union to give its residents a free ride on public transport. Tallinn’s nearly 420,000 registered residents are entitled to ride all municipal buses and tramlines free of charge after buying a special green transport pass for just €2. Public transport was already free for senior citizens. Email “Luxembourg to make travel free on its trains, trams and buses ”. Feedback on “Luxembourg to make travel free on its trains, trams and buses ”.